On the campus of the National Fire Academy. IMPORTANT: This virtual cache is located at the National Fallen Firefighters Memorial Park in Emmitsburg, MD. The park is located on the campus of the National Fire Academy, which is a controlled access federal property. Access will be restricted if the Terror Alert Level is raised. Upon arrival, you will need to show ID and may be subject to a random vehicle search. Be sure to view the preceding link for further information prior to your visit. When you arrive, let them know you are there for the Memorial Park, which is available from dawn to dusk. The Chapel and many other buildings on campus are listed on the National Register of Historic Places. In 1997, the site was designated as the National Fallen Firefighters Memorial Chapel to denote its special bond to America's fallen firefighters and their families. 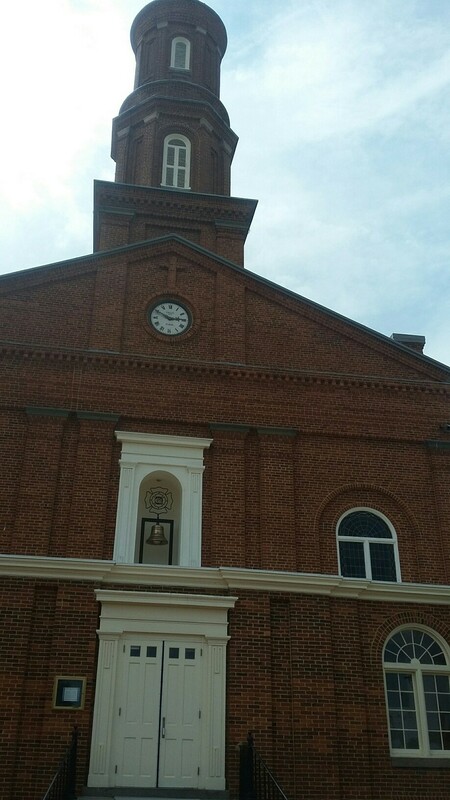 During the early 1800s, Mother Elizabeth Ann Seton, the only canonized American-born saint, established the Daughters of Charity in Emmitsburg. In 1809, she opened a boarding school for girls on this site. The school later became St. Joseph's College, one of America's first Catholic women's colleges. Mother Seton selected the site for the Chapel before her death in 1821. Construction of the Romanesque Revival-style chapel began in 1839. The exterior is brick set on a stone foundation. Tuscan pilasters with granite capitals and bases, semi-circular stained glass windows, brick dentils, and a wood niche grace the outside of the building. A low, turned rail separates the nave from the sanctuary with its marble altar and massive pedimented niche. The bell that hangs in the steeple came from Spain in 1841. During the Civil War, the Daughters of Charity went to the nearby Gettysburg battlefield and set up headquarters in the McClellan Hotel. From this base, they went out to several sites to nurse the wounded. Both Union and Confederate troops were on the Emmitsburg campus prior to the end of June 1863. After the Battle of Gettysburg, Confederate soldiers passing by the campus in escape were fed. The Daughters of Charity closed the College in 1973, and sold the buildings and more than 100 acres to the Federal Government in 1979. 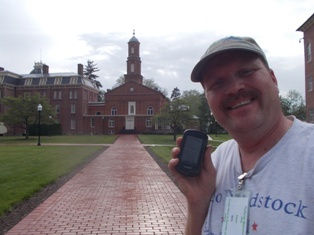 Logging Requirement: To confirm your visit please post a photo of yourself and / or your GPS at the chapel. This was originally listed on Navicache, but have decided it is long past time to move it over to OCNA. W 77° 19.615' Gated entrance to the campus. Found twice in two weeks! The Chapel was my 3rd stop in this strange (to me) Government facility. But it's not as strange now, that this cache page tells me it was a private College that closed in 1973. (I didn't read the description very carefully on the GPS while I was there). I visited the Firefighters Memorial itself first, but I don't do Geocaching.com where it's a virtual, and my Magellan didn't like the Terracaching.com .gpx file, so I couldn't do it as a virtual there. By the way, how many people would be asking to visit Memorials on the grounds if it wasn't for that GC.com virtual? This is an impressive building! 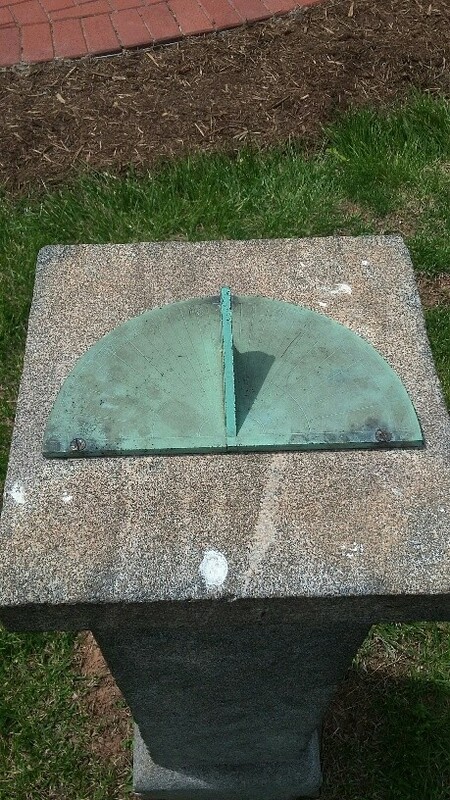 Was there about 2:55 PM, and the sundial out front read exactly 3:00. Those things work! Initiial pic of just the building itself, I have to get the wife to send one of me in front of it from her phone. Thanks! I was reasonably nearby due to a Groundspeak event - 2016 Cache Across Maryland and decided to come up here to visit this location. I spent the afternoon caching the Antietam Adventure (Groundspeak) lab trail with DudleyGrunt (CO for this cache) and ozzy1602 (I highly recommend that excellent adventure). 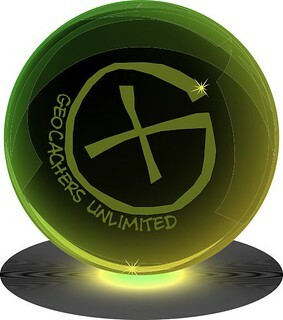 I ended the day with 30 geo-based finds: 28 Groundspeak geocaches (18 of the normal variety and 10 lab caches on the Antietam Adventure trail), 1 Opencaching North America geocache and 1 GeoVexilla flag (Saint Kitts and Nevis). I had a little challenge getting in. 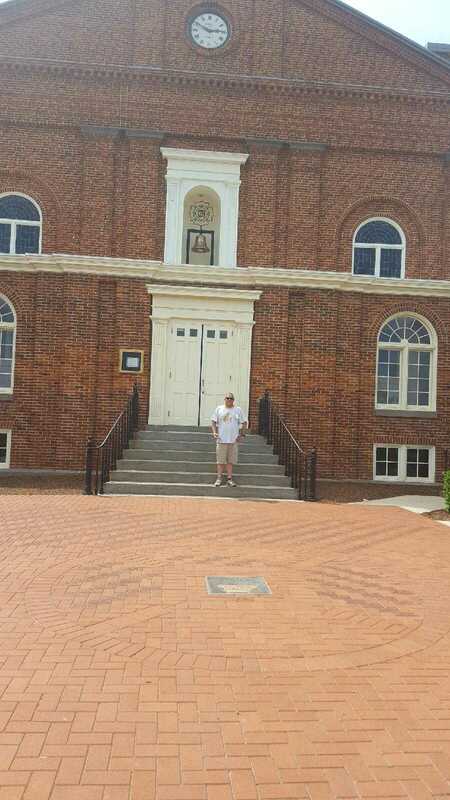 Mainly because I stated I wanted to visit the Chapel. The Security Officer took that to mean inside and she stated that I could not because it was not open. But after I explained I only want to visit to take a photo and get a couple shots of the Memorial she let me pass. She was familiar with the term geocaching and I really believe that is the only reason I got in. I'm giving this cache a recommendation!